Our Mission: Davis Legacy Soccer Club exists to provide the highest levels of quality soccer training for the players and to enhance their social/emotional and physical health, in a positive and safe environment. Our Vision: Davis Legacy Soccer Club will strive to create and nurture a valuable soccer learning experience. To achieve this goal we will make every effort to insure that well-educated coaches develop the skills, fitness, teamwork and sportsmanship and to foster and perpetuate these qualities at all levels of their soccer growth. We will endeavor to empower our players with a life-long passion and love for the game of soccer. 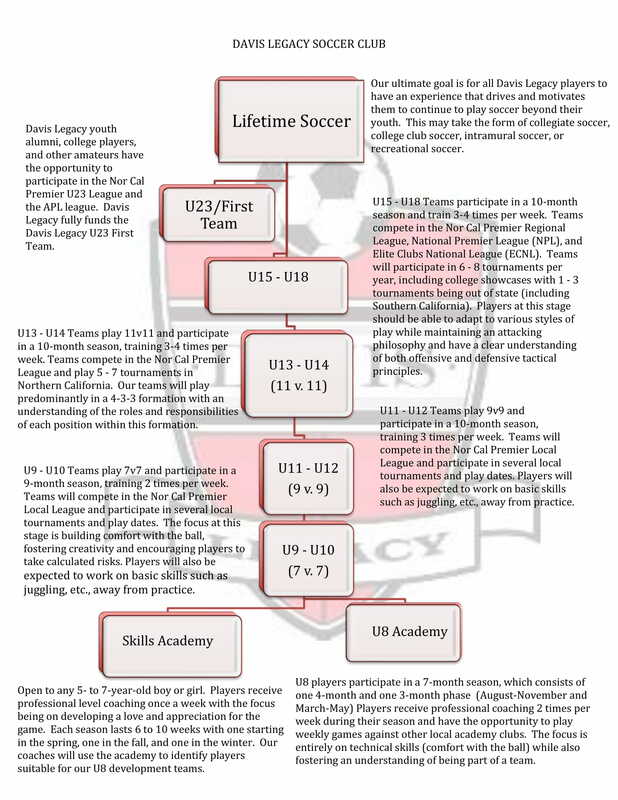 Our Philosophy: Davis Legacy Soccer Club will create an environment where our players develop a love of the game of soccer and continue to participate in the sport throughout their lifetime. To achieve this goal, we must develop an environment where we teach a creative, attacking, and possession-style soccer built on a foundation of strong technical skills. With this in mind, mistakes will be inevitable, and games may be won or lost through players ‘trying things’ such as building up from the back. However, we never benchmark our players, teams, or coaches success purely on results, especially in U8 – U13 where players develop both physically and technically at much different rates (e.g., the most dominant player or team at U9 is seldom the most dominant player or team at U12). 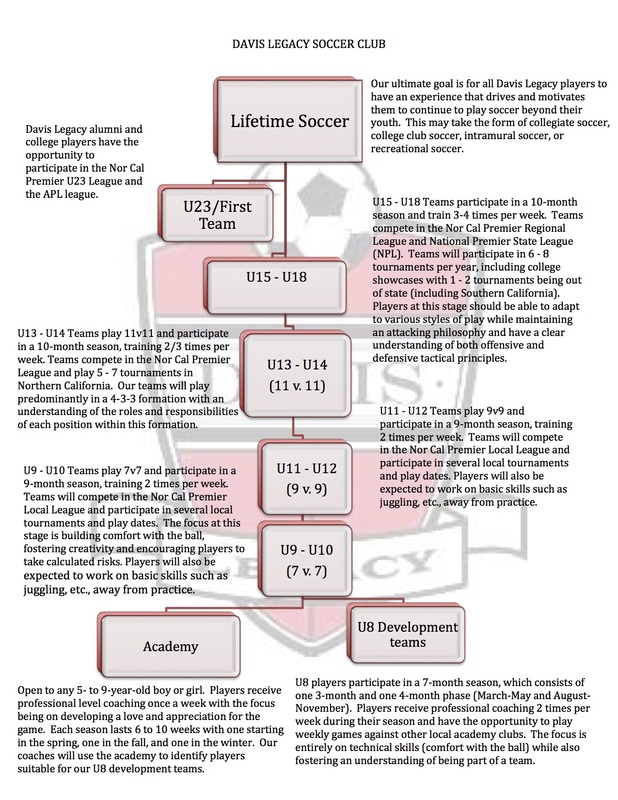 Our club structure, outlined below, provides a clear pathway for players to reach our ultimate goal in a manner that is consistent to our overall philosophy.